Milwaukee has shrunk since the 1960s, when its population was about 19 percent bigger than today, leaving the city with a lot of excess road capacity. 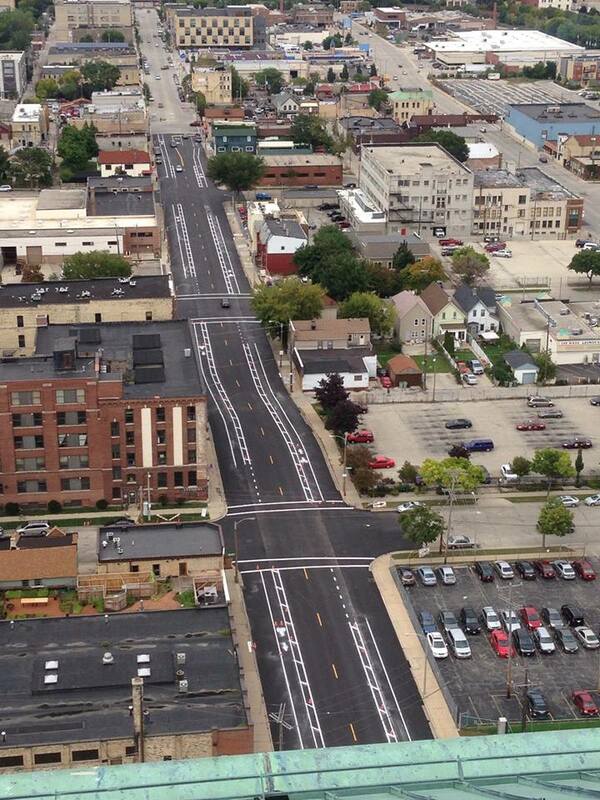 As a result, Milwaukee is a city where it’s relatively easy to replace general traffic lanes with bike lanes. Other cities in the Rust Belt — and anywhere suffering from population loss — could be doing the same. Leveraging its High-Impact Paving Program, the City of Milwaukee is rapidly adding new buffered bike lanes and replacing existing worn bike lanes and cross walks on major streets across the city. The program was started in 2013 to try to stretch existing maintenance funding after years of state cuts in shared revenue to municipalities, and seeks to make quick, relatively low-cost repairs to roadways in dire need of resurfacing. When an arterial street is resurfaced as part of the rapid fix program, the city evaluates current traffic volumes and is able to make some geometric updates if needed using the new pavement marking patterns. In many cases these roadways were widened decades ago to serve our then growing traffic volumes during Milwaukee’s industrial heyday when thousands of factory workers began driving to work in large factories. Those big peak-hour traffic volumes required the city to widen many of our historic boulevards and streets. Since most of those factories are no longer open, the streets have more travel lanes than needed, which encourages speeding. If those streets were repaired with a more expensive full-reconstruction project, the entire roadway might be narrowed by moving the curbs in. That is what was done on S. 2nd Street by Rockwell and north of National Ave. When the street was reconstructed the sidewalk areas were widened and bike lanes were added where the now-unneeded extra vehicle lane was added years ago. This process is commonly called a “road diet” and is happening in cities across the country. If the street was resurfaced as part of a normal full reconstruct, DPW might have added curb extensions or installed plastic bollards in the buffered area and moved the bike lane between the parked cars and curb to create a truly protected bike lane like those you find in Chicago, Minneapolis and most other major cities. Elsewhere on the Network today: Pedestrian Observations refutes common excuses for why subway construction costs are so high in New York City compared to international peers. And Macalester students make the case for “making bicycling great again” at Streets.mn. One of the most effective ways to get elected officials to pay attention to traffic safety is to spell out the dangers in their own districts. A new effort from a coalition in Milwaukee does just that, crafting reports for each of the city's 15 aldermanic districts on the eve of the Wisconsin Bike Summit. Milwaukee will be getting its first bike boulevards, the city announced this week, the beginning of what should eventually be a citywide network of low-traffic, low-stress streets for cycling.